The prospect of reversing the aging process by about 10 years or more is certainly appealing, especially if you have noticeable facial wrinkles. Sadly, many women spend thousands of dollars on plastic surgery that simply makes them look more “manufactured” than youthful. However, it is actually possible to replenish the skin and effectively remove wrinkles using natural ingredients that work symbiotically with your body’s largest organ (the skin) to restore the beauty, elasticity, and shine that was once evident during your teenage years. Studies have shown that the best way to reverse the effect of aging and rejuvenate the skin is to utilize a combination of healthy dieting and proven topical solutions. 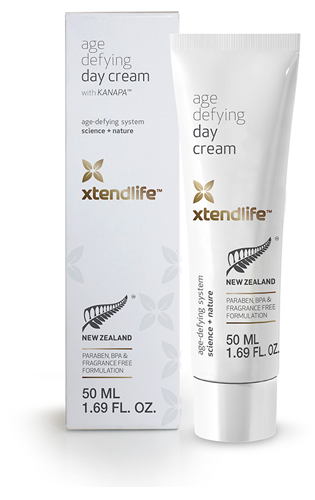 One such solution that has been gaining a lot of popularity recently is the Xtend-Life Age Defying Day Cream, which is thoroughly reviewed below. Xtend-Life Age Defying Day Cream works by reversing and repairing the three main characteristics of aging skin – a loss of natural elastin and collagen over time, a decrease in hyaluronic acid, and an increase in free radicals that cause oxidation within the skin. Elastin and collagen are two proteins that your skin relies on to remain flexible yet firm. As you age both of these proteins are lost, causing the skin to sag and become wrinkled. Hyaluronic acid is a polymer that holds moisture within the skin, regulates the repair of tissues, the reproduction of cells, and inflammatory and immune responses. Without hyaluronic acid skin easily becomes scarred, wrinkled, flabby, and generally undesirable. Free radicals are electrically charged molecules that damage the membranes of cells and cause a higher risk for skin diseases like skin cancer. By restoring elastin, collagen, and hyaluronic acid levels, and limiting the amount of free radicals within the skin, Xtend-Life Age Defying Day Cream quickly restores skin tone, elasticity, and overall beauty. The active ingredients in Xtend-Life Age Defying Day Cream work in synergy with each other to accomplish the aforementioned tasks. There are currently nine active ingredients within the cream, with the three main ingredients being Xtend TK, Phytessence Wakame, and Nano-Lipobelle H EQ10. Xtend TK is responsible for restoring elastin and collagen levels, and contributes to the regeneration of new skin cells to reverse the aging process. Phytessence Wakame effectively increases levels of hyaluronic acid for better moisture retention and shinier, healthier skin. Nano-Lipobelle H EQ10 is a unique version of coenzyme Q10 that is effective at penetrating through all seven layers of the skin to completely eradicate free radicals. Aside from these ingredients there are also six others – Maracuja, Babbassu, Grapeseed Oil, Crodamol OP, and all-natural Vitamin E.
What Makes Xtend-Life Age Defying Day Cream Special? With a plethora of skin care products being released and marketed every year, it can be difficult to distinguish one from another. Xtend-Life Age Defying Day Cream is special because it goes beyond the surface of the skin to correct deficiencies that are at the root of the wrinkles. By restoring simple biological functions and keeping the skin moisturized, the cream actually reverses aging in just a couple of weeks. Also, unlike other skin care products, Xtend-Life Age Defying Day Cream had a subtle aroma, does not block pores, and is suitable for individuals with sensitive skin. Despite the fact that Age Defying Day Cream is much less expensive than other professional grade skin care products, it has been proven to be just as effective in several studies.